The original plan was to do stuffed baked artichokes, but I have a nasty cold and just couldn’t muster the energy. I wanted something equally tasty but quicker and less fiddly. The solution was to use the ingredients for stuffed artichokes and to simply mix them together to create a one-dish meal. Same flavours, less work. Deconstructed rustic cooking. Could this be the birth of a whole new trend? The breadcrumbs in fact are not so much a topping here as an ingredient in their own right, which I suppose is only natural seeing that they were originally part of the stuffing, along with salami, oil and cheese. 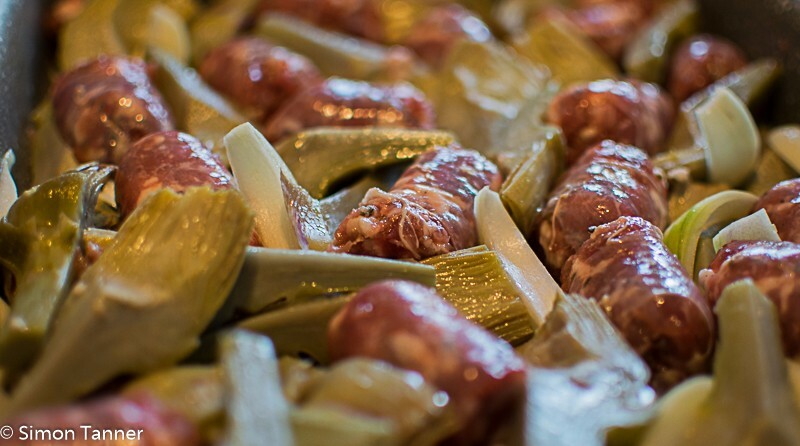 They bring everything together, not only acting as a kind of binding agent, but embodying the essence of the dish, having soaked up artichoke juice, oil and sausage fat. They also provide attractive crunchiness. Prepare the artichoke hearts and cut them into four segments. This 20-second video makes it much clearer than I ever could in words. The only variation I suggest is to cut the hearts into four segments before removing the choke. This means you can do so quickly with a knife rather than bothering with a melon baller. Anyway, as you prepare your artichoke segments, place them immediately in a bowl of water into which you have squeezed the juice of two lemons. Then drain and cook them in boiling salted water, to which you have added 1 tablespoon white wine vinegar, for about ten minutes, until cooked but al dente. Drain and place in a roasting tin. Add the sausages, onion and oil to the tin and mix well. You won’t need to add any seasoning, since the sausages have enough of their own, and the artichokes have been cooked in salted water. Place in the hot oven and bake for 20 minutes. Meanwhile, mix the cheese and breadcrumbs in a bowl. 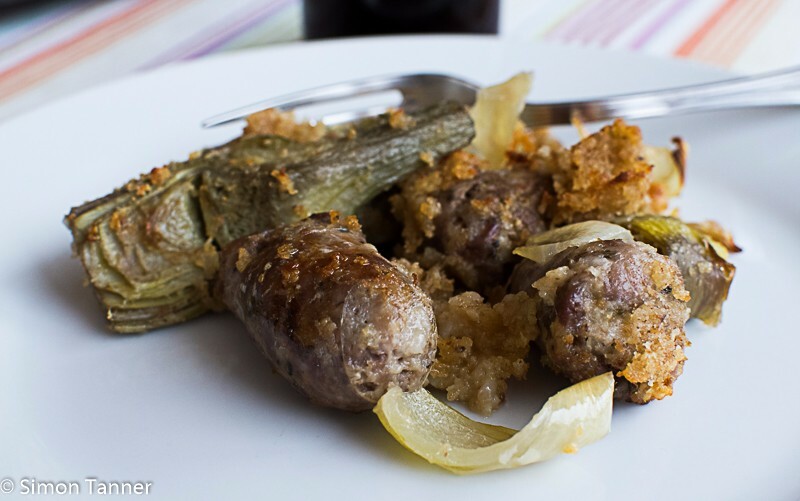 Take the tin out of the oven and mix in the grated cheese and breadcrumbs with the sausages and artichokes. Place the tin back in the oven for a further 15 minutes. Take the tin out of the oven again and remix, breaking up and redistributing the breadcrumb crust that will have started to form on the base of the tin. Back in the oven for a final 10 minutes, turning on the grill at full blast for the last few minutes to brown and crisp up the breadcrumbs. This entry was posted in Meat, Recipes, Vegetables & side dishes and tagged artichoke, carciofi, pork, salsicce, sausages, vegetable by hungryenglishman. Bookmark the permalink.